EMC snc proposes him on the National market and International as qualified manufacturer of machines for the workmanship of the leather. 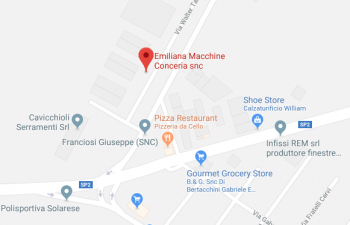 This firm was born from an idea and by the experience of its founder Enea Cavallini, from decades known for the planning and the realization of machines of undisputed quality and reliability, and from his son Stefano, which directs the organization and the business. The company, organized in different sectors, fully satisfies the necessities proper of the great dynamic structures, guaranteeing to his clients the whole necessary assistance. Moreover, thanks to the specialized personnel in the planning and in the development of the tannery machines, using the most advanced technologies, it is always able to offer new products. For this the EMC snc assures the reliability and the sturdiness of his products in the world, qualifying itself as supplier of technologically undisputed and high performance products.